Sam Hunter and Adam Kirkwood extract a permafrost cores from a palsa in Polar Bear Park, Ontario. Adam Kirkwood won a Weston Wildlife Conservation Society-Canada Fellowship for his M.Sc. project on The significance and vulnerability of carbon and mercury stores frozen in palsa mires of the Ontario Far North. 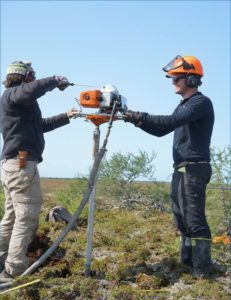 He will be working on cores extracted from intact, partially degraded, and degraded palsas extending along a latitudinal gradient between Peawanuck and Attawapiskat. Adam will 1) characterize the microbial community in the cores with eDNA (targeting methanogens, SRB and Hg methylation genes with sequencing and qPCR); 2) incubate the samples to assess greenhouse gas production potential; and 3) analyzed them for total mercury and methyl mercury content. This project is a collaboration with researchers from the Ontario Ministry of Natural Resources and Forestry, who have equipped the palsa gradient with climate stations, permafrost monitoring stations, and flux towers, and with the BIOTRON Institute for Experimental Climate Change Research at Western University, and the Vale Living with Lakes Center at Laurentian University. 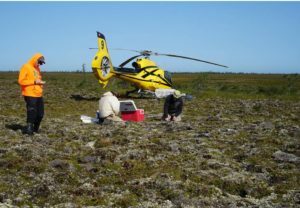 Adam Kirkwood, Mark Crofts, and Benoit Hamel take field notes and package a permafrost core before leaving a site. Adam’s project directly addresses concerns and priorities identified by the Muskegowuk Council, which has given its support to the project, and we look forward to sharing information with Muskegowuk communities. A poster in Cree and English (Greenhouse gas emissions from thawing permafrost in Polar Bear Provincial Park – ᑲᑎᑭᑌᐠ ᐱᑐᐡ ᑲᑎᑭᐠ ᐁ ᐃᔑ ᑭᔑᑲᐠ) with information on some aspects of this project was presented earlier this year at the Muskegowuk Climate Summit.